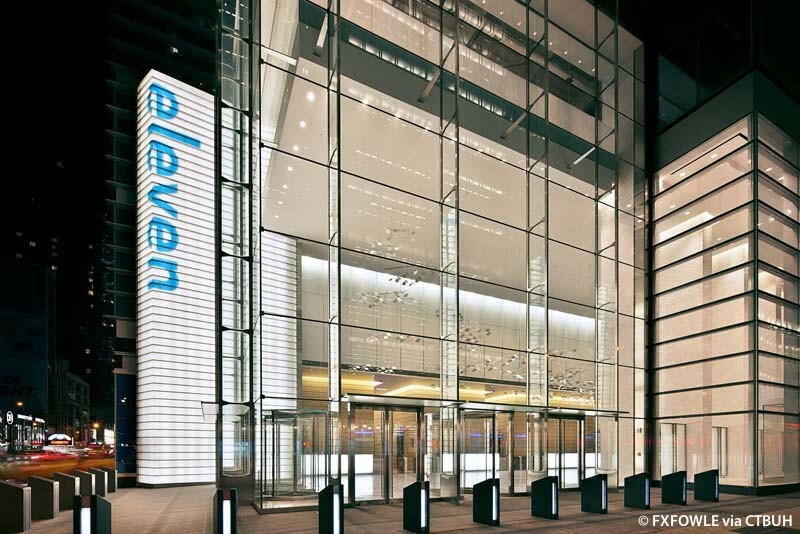 Eleven Times Square is a glass-clad commercial tower that occupies a full block front along Eighth Avenue between West 41st and West 42nd Streets in New York City. 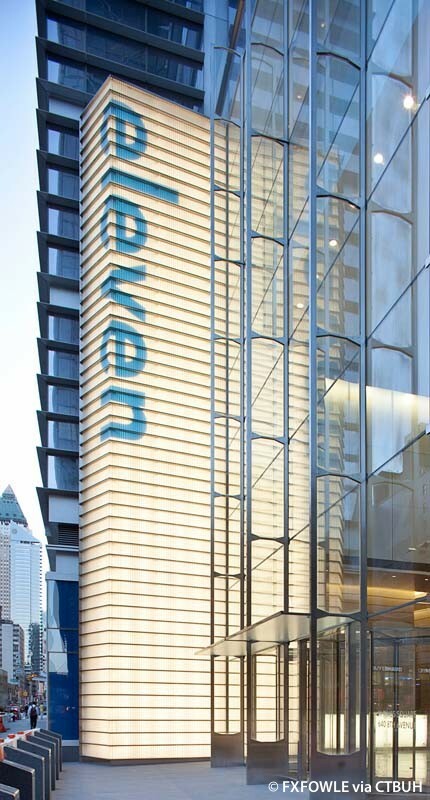 Designed to extend the vibrancy of Times Square and meet the needs of high-end corporate tenants, its form was derived from an insightful observation of the context. 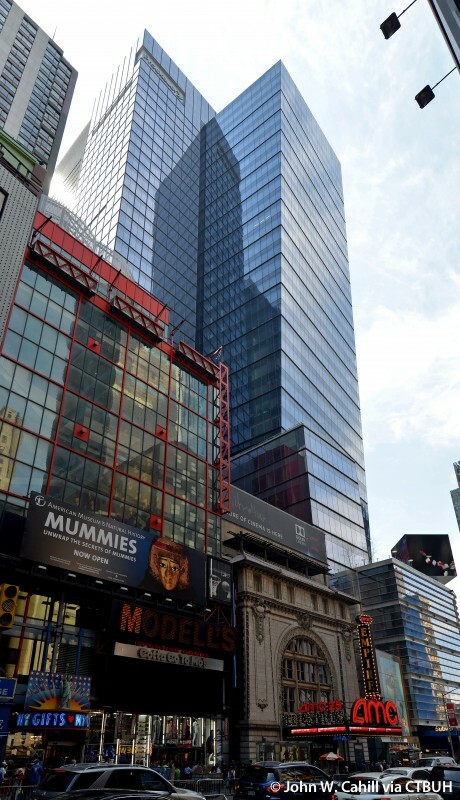 Three independent but interrelated components comprise the structure: a six story ribboned base that wraps the corner of 42nd Street and Eighth Avenue; an outwardly sloped glass-clad “crystal” that preserves sight lines along the 42nd Street corridor; and a 40-story spine that anchors the commercial properties of the building. 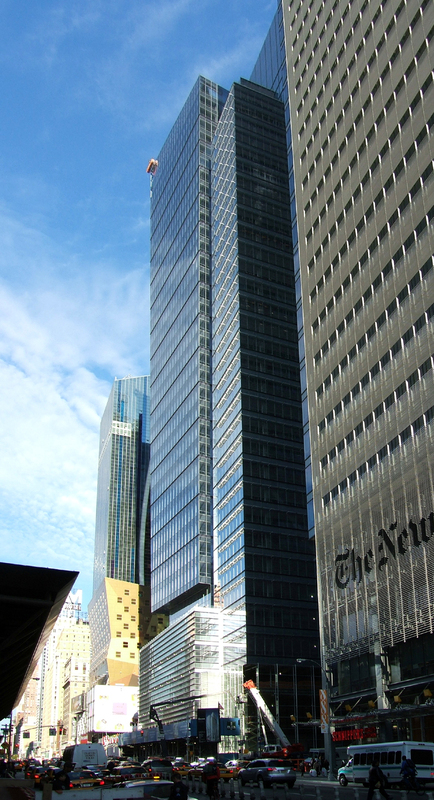 Eleven Times Square is an inversion of Manhattan’s zoning paradigm where buildings taper as they rise. 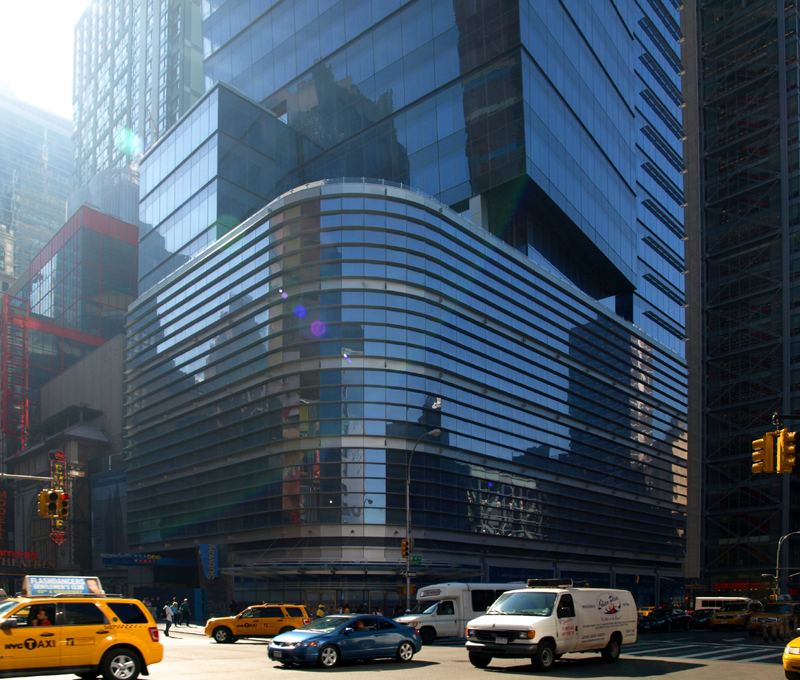 Here, the building’s structure along 42nd Street rests on a six-story podium, which reinforces the street’s pedestrian-oriented scale and retail-entertainment environment. The podium terminates in a deep setback that accommodates large scale, three-dimensional LED displays, further contributing to the vibrancy and luminescence of 42nd Street. 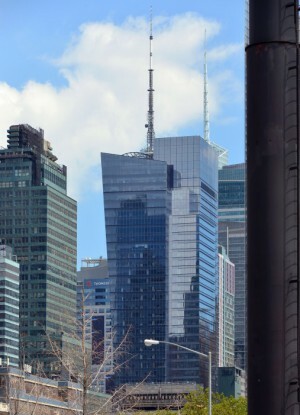 Set in at its base and then sloping out towards the street line as it progresses upward, the Crystal engages the Westin Hotel across 42nd Street to establish a western gateway to the Times Square. 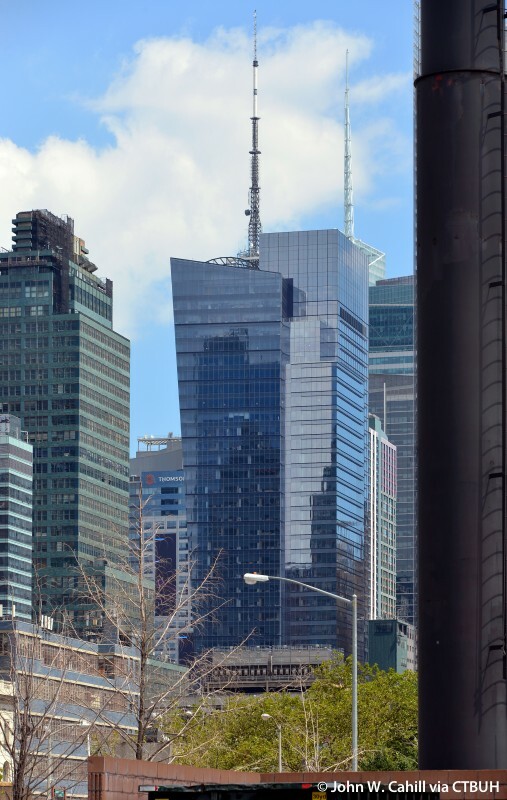 Its distinctive sloped form is crowned with a chiseled profile while preserving views to the landmark Candler and McGraw-Hill buildings. 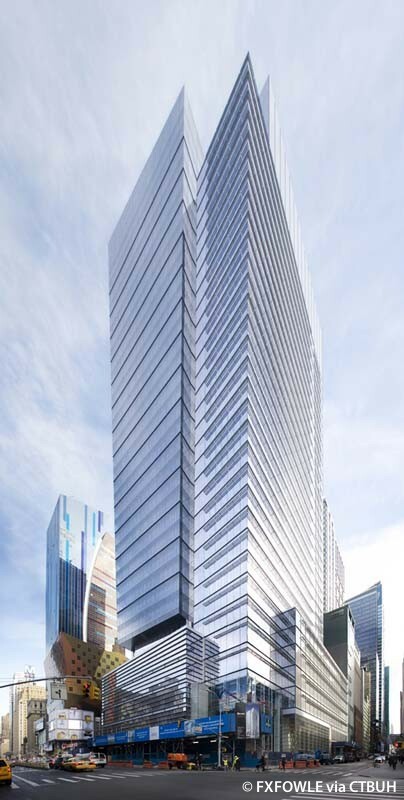 The outward sloping form achieves a civic gesture of gateway, while simultaneously creating more floor area in the upper, valuable portion of the tower. A site geometry that could not support a center-core building greatly influenced the building’s architecture. Structural engineers determined that a side-core design provided the most efficient lateral and torsional stiffness for the structure. A sloping north face sets the building’s concrete core in the crook of the L-shaped site, offset from the bulk of the tower’s mass. Steel floor framing kept the weight of the building low, reducing torsion and lateral drift induced by the 30-foot cantilever. Due to its efficient configuration and low weight, under wind loads the tower develops tension uplift beneath the concrete core. To resist these forces, a system of rock anchors is installed under the core. 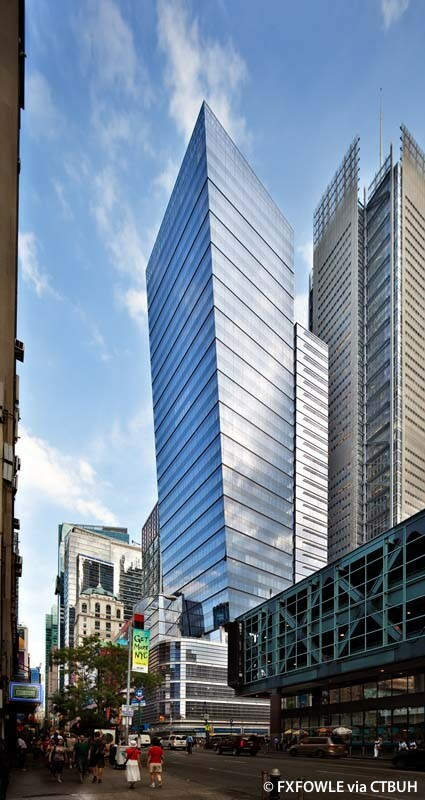 The building’s floor construction and perimeter gravity-supporting structure are steel, providing a flexible structure ideal for the New York office market. The frame maximizes the floors’ regularity and flexibility so that connections and materials are readily accessible to the tenant. Above the fifth floor, column layout is closely coordinated with the architecture to provide column-free corners and façades, maximizing views of the Hudson River and midtown. The building’s southwest corner features a dramatic 45-foot cantilever corner to keep the corporate lobby entrance clear of columns. 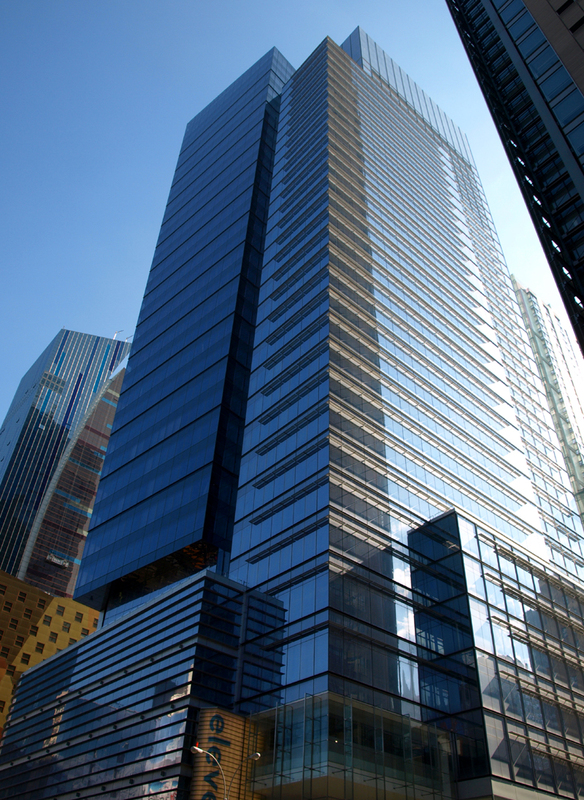 Office buildings in this climate are almost always in cooling mode, and therefore the reduction of solar gain was a driver of the building’s form and expression. 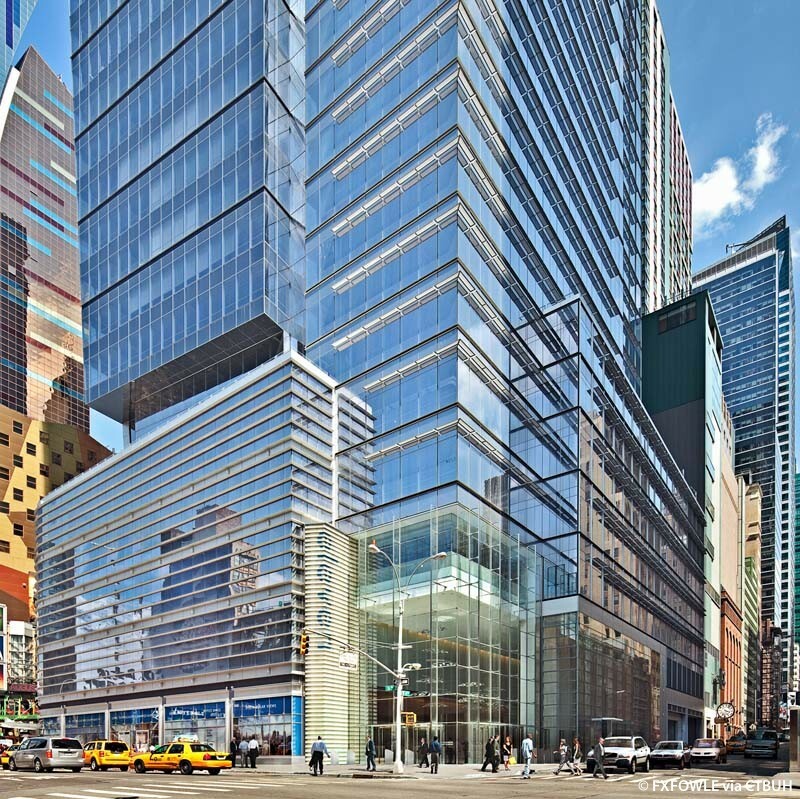 The building has varying curtain wall treatments on its north and south façades, which are strategically chosen to minimize energy use and create an optimal working environment. The south portion of the building—exposed to the most sun—has reflective glass and perforated aluminum sunshades that cut down on glare and heat. In contrast, the 42nd Street portion is sheer and more transparent welcoming in softer, northern light. 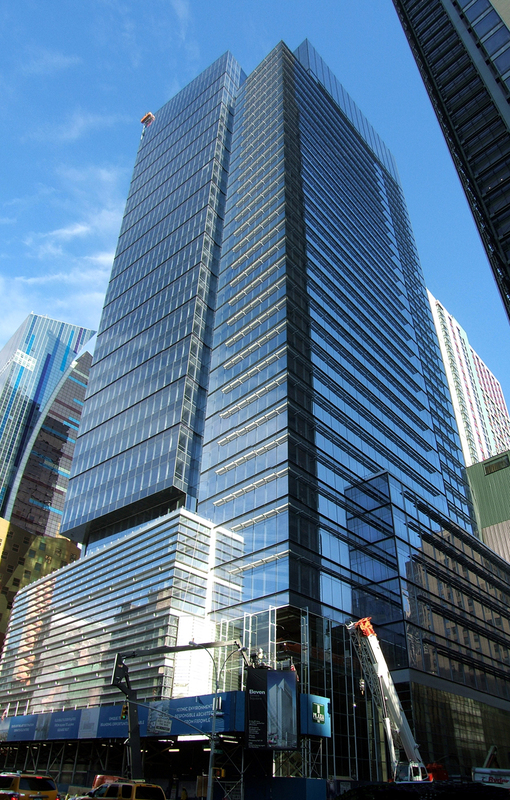 The façade is structurally glazed, meaning there are no exterior mullion caps, which can create heat transfer points. Additionally, stainless-steel spacers were used between the lites at the edges of the panels, where curtain walls lose most of their heat, rather than aluminum, which is one of the best conductors available.